Liverpool Ladies manager Matt Beard says playing against Manchester City Women is like facing an "international side". City beat Liverpool 2-0 on Thursday evening to stretch their run of unbeaten matches to 13 and put them two points behind leaders Chelsea. "Man City are an unbelievable team, let's be honest," Beard said. "I said to my the girls after the game, it's like playing against an international side." Beard continued: "With their pattern and movement, you can see why teams just sit off them and drop deep because of the way they move the ball so quick." Five players in City's starting line-up currently play for England, while Isobel Christiansen has just received her first call-up to the senior side. Jennifer Beattie and Natasha Harding also represent Scotland and Wales respectively. The team are enjoying only their second season in Women's Super League One and are two points behind leaders Chelsea, with two matches still to play. Beard says that the quality of City's squad could see them monopolise the women's game for years to come. "I think they're going to go on and dominate the English league because you can't compete with it as a football club," Beard said. 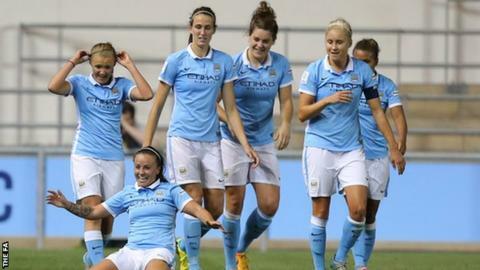 "Man City deserve a lot of credit for what they've done for the women's set-up. "At the end of the day, you pay for what you get and they've got a team full of internationals."